A few deliveries came in at the same time. I'm posting this a day late since yesterday's Sengoku Basara 4 news update deserved my full attention. My regular monthly dose of JoJo's Bizarre Adventure on Blu-ray arrived from Yesasia accompanied by Kotonoha No Niwa (The Garden Of Words), the newest Shinkai Makoto movie. The trend of including English subtitles with Japanese discs is wonderful. Yesasia also supplied the two CD singles in this selection of goodies: Linked Horizon's Jiyuu He No Shingeki (CD+DVD version) and an old Strawberry Panic CD which I've never managed to come across any cheaper in my trips to Japan. The Linked Horizon packaging comes with the song lyrics, so maybe now fans of Shingeki No Kyojin (Attack On Titan) can stop arguing over how the German parts of the songs are worded? Over on the right is the Gargoyles season 2 volume 2 DVD set, bought from eBay after Disney gave it a weird US-only limited release. Some guy on eBay made a lot more profit out of the deal than Disney did. That doesn't matter though, because I now have all of the second season of Gargoyles on DVD! 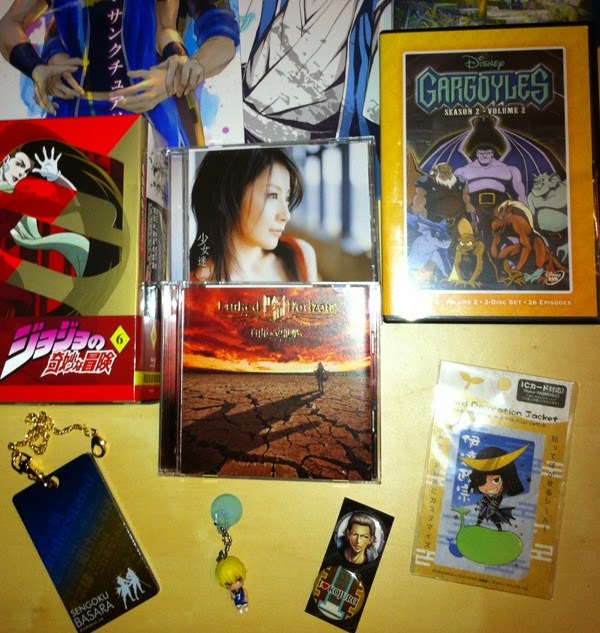 At the very back of the photograph are the two newest additions to my doujinshi library, then a couple of miscellaneous Sengoku Basara badges and IC pass accessories finish off the picture. At the moment I have far more card holders than things to put inside them. Why do I keep buying more? 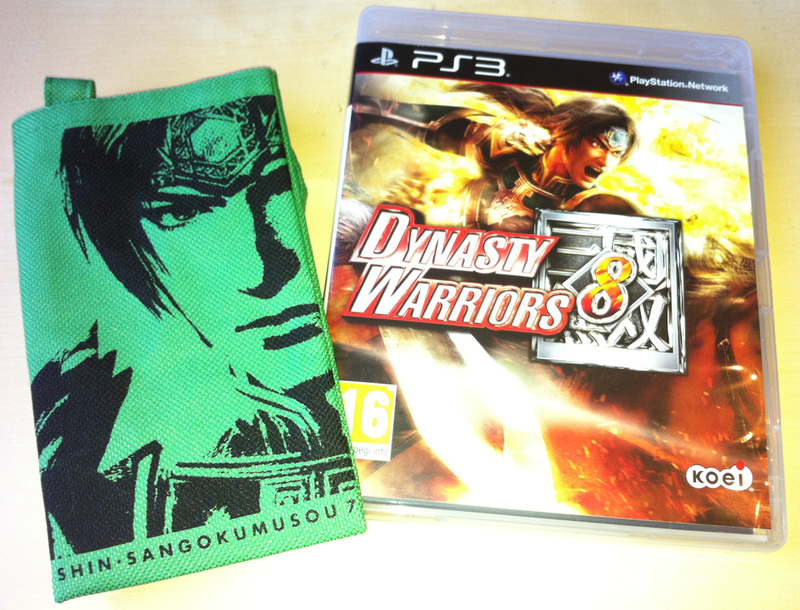 This extra bundle didn't really arrive today, however I wanted to go on record to say that I managed to get my PS3 copy of Dynasty Warriors 8 on time for once courtesy of Game's website! Dynasty Warriors 8 is the English version of Shin Sangoku Musou 7, as the extra mobile phone pouch confusingly demonstrates. I was hoping for the Wang Yuanji design for my bonus preorder item but you can't go wrong with a lovely emerald-green Zhao Yun. Although I received the game in time for its release, I'm holding off starting to play it until the Japanese voice DLC pack goes up on PSN. As great as the Dynasty Warriors games are, I prefer them to be presented in the original language.